Seems we all live in our own little worlds and – while observing what’s going on in the various regional perceptions of Karate around the globe – successively try to make sense of and adjust our subjectively coherent perceptions of the art so as to maintain our castles made of sand against the flood. The earliest known design of a Matsubayashi-ryū insigina, found in a 1950s newspaper (collection of the author). The earliest known design of a Matsubayashi-ryū insigina is found in a 1950s newspaper article: In the middle on top, the character for Oki, on both sides of which ropes (nawa) lead down and are tied together at the bottom, describing a circle. Together this makes, of course, Okinawa. Inside are placed a forearm crossed with a Sai. The background obviously delineates the fabric of a jūdō jacket. The original self-perception of Matsubayashi-ryū by its founder was that of a Karate and Kobudō style. This can be derived from the cover page of a notebook written by Nagamine Shōshin, which was a first attempt of consolidating his studies which where extensively published in newspapers and magazines since the early 1950s and later were published as books. The titel reads “The essence of Matsubayashi-ryū Karate-dō Kobudō” (Matsubayashi-ryū Karate-dō Kobudō Giyō, and the school itself was referred to as “Training School of Matsubayashi-ryū Karate-dō Kobudō” (Matsubayashi-ryū Karate-dō Kobudō Kenkūjo). “The essence of Matsubayashi-ryū Karate-do Kobudō” (collection of author). According to the above, it was obviously only later that it was solely referred to as Karate. And there is no problem with it: in Okinawan perception Karate and Kobudō historically, culturally, and technically belong together. This can be expressed by simply saying Karate. It is implicit: while today Okinawa’s largest and all-uniting umbrella organization is simply called the “Association for the Promotion of Traditional Okinawa Karate” (Okinawa Dentō Karate-dō Shinkōkai), it includes – of course – both the various styles of Karate and Kobudō. In this terminological sense, Karate is considered an all inclusive term generically subsuming each and any method of traditional Okinawan martial arts. In the evolution of the Matsubayashi-ryū insignia, although the term Kobudō had been canceled at some point, this concept survived maintaining the Sai as a very symbol for Kobudō within the insignia. 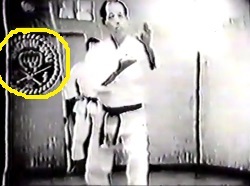 Matsubayashi-ryu footage, probably shot during 1969 or 1976, showing Nagamine Shoshin and in the back the insignia (snapshot from film posted by Angel Lemus on facebook). Recently Angel Lemus of the ZENTOKUKAI posted some older Matsubayashi-ryū footage, probably shot during 1969 or 1976. There we see a more modern version of the Matsubayashi-ryū insigina. SHORIN-RYU in capital letters written above. 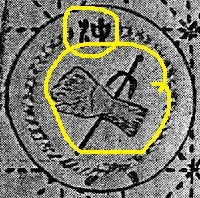 Below the front-view of a fist, and below it a pair of crossed Sai, tips pointing upward, with the character Kara (left) and te (right) and all still surrounded by the rope (nawa) of the earlier design, though now without the character for Oki. The present design of the Matsubayashi-ryū insigina (right). On top SHORINRYU in capital letters is written. Below the front-view of a fist, and below it a pair of crossed Sai, tips pointing upward. This is basically the same as previously. But the kanji are now Matsu (left) and h(b)ayashi (right). It is now surrounded by a stylized flower form replacing the initial rope. 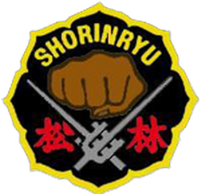 This entry was posted in Book Reviews and tagged insigina, Karate and Kobudo, Matsubayashi-ryu, Nagamine Shoshin, Okinawa Dentō Karate-do Shinkokai, Okinawa Karate, Okinawa Kobudo, Shorin-ryu. Bookmark the permalink.